Thirty years ago this week the first European-built Spacelab was launched on the Space Shuttle. ESA’s first astronaut, Ulf Merbold, flew on the mission, marking ESA’s entry into human spaceflight. 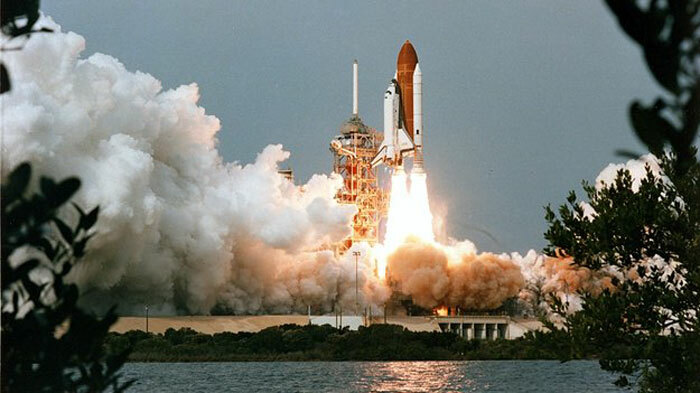 On 28 November 1983 at 11:00 local time, the ninth Space Shuttle mission was launched from Kennedy Space Center, Florida, USA. The six astronauts on Spacelab-1 worked in two teams on 12-hour shifts, allowing for continuous operations. They performed over 70 experiments in solar physics, space plasma physics, astronomy, Earth observation, material science, technology and life sciences. After circling Earth 166 times in just over 10 days, Space Shuttle Columbia landed back on Earth on 8 December. 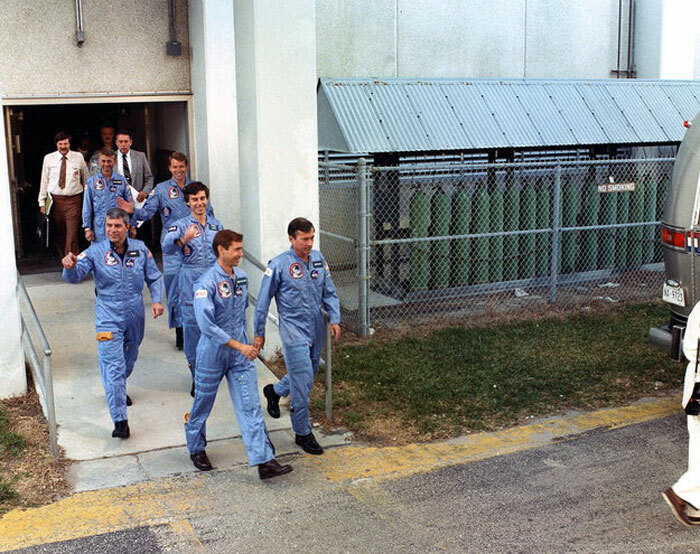 The Spacelab-1/STS-9 crew walk out to the Crew Transporter Van on the way to the launch pad on 28 November 1983. From back left, Owen Garriott, Byron Lichtenberg, Bob Parker, ESA’s Ulf Merbold, Brewster Shaw and John Young. Spacelab was a cooperation between ESA and NASA, with Europe responsible for funding, designing and building Spacelab and agreeing to deliver free of charge the engineering model, the first flight unit and ground equipment in return for a shared first mission. In preparation for Spacelab, ESA Member States in 1978 put forward 53 astronaut candidates, and four were selected: Ulf Merbold of Germany, Wubbo Ockels of the Netherlands, Claude Nicollier of Switzerland and Franco Malerba of Italy. Ulf was selected for the first Spacelab mission, with Wubbo as backup. Wubbo flew on the Spacelab-D1 mission in 1985. Between 1983 and 1998, Spacelab modules flew on the Space Shuttle 22 times and totalled 244 days in orbit. Experiments surveyed the possibilities of weightless research in many scientific areas that led to space-age metals used in mass-produced smartphones and revealed areas of space research that show promise in treating chronic muscle diseases. 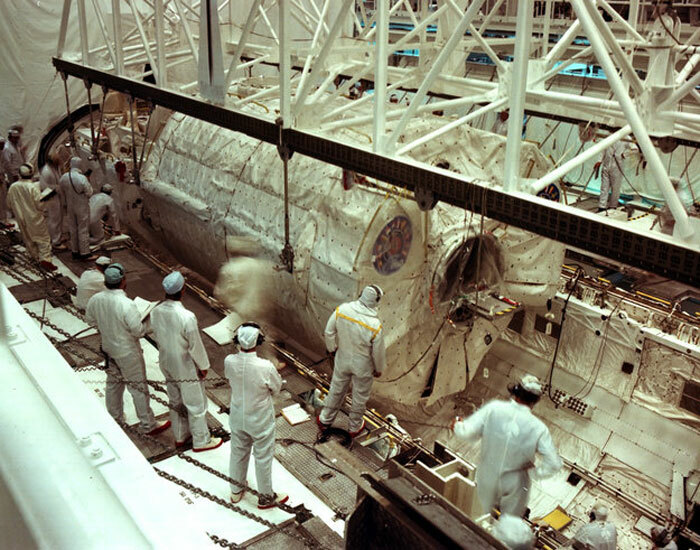 Preparing Spacelab-1 at the Kennedy Space Center for its flight on Space Shuttle Columbia (flight STS-9) in November–December 1983. ESA developed Spacelab as a manned scientific laboratory to fly on NASA’s Space Shuttle. Ulf Merbold, who was part of the Spacelab-1 crew, became the first ESA astronaut in space. Many of Spacelab’s features live on in space hardware that is flying above us today. The pressure shell was reused for the Harmony and Tranquility modules on the International Space Station, and supply spacecraft, such as ESA’s Automated Transfer Vehicles and the commercial Cygnus, reuse Spacelab’s exterior structure. Europe’s Columbus laboratory on the Station evolved from Spacelab. On the inside, Spacelab used standardised science racks that contributed to its success and were adopted for all of the Station’s laboratory modules. In the same way that Spacelab was operated by international teams of astronauts, so are today’s European experiments and laboratories on the Station. They are kept running and performing science by the Station’s permanent crew – which now includes European astronauts. 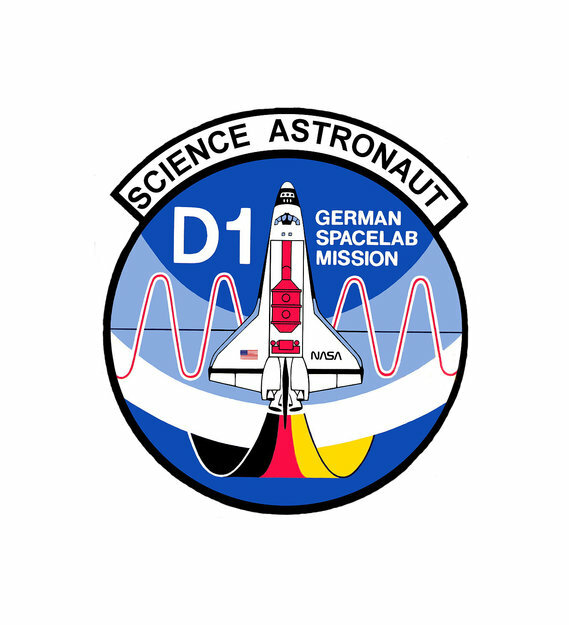 STS-61A was a scientific Spacelab mission funded and controlled by West Germany, hence the name D1 (for Deutschland 1), in October/November 1985. 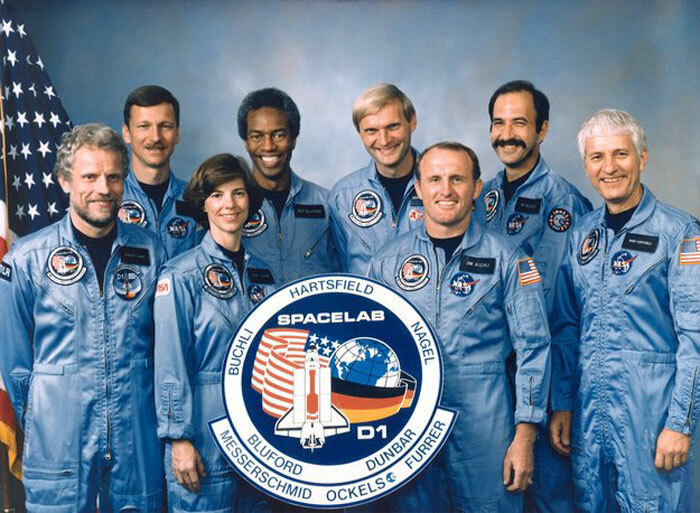 On board the Space Shuttle Challenger were Henry Hartsfield, Steven Nagel, Bonnie Dunbar, James Buchli, Guion Bluford, Ernst Messerschmid (DE), Reinhard Furrer (DE) and ESA astronaut Wubbo Ockels (NL). STS-61A holds the record for the largest crew, eight people, aboard any single spacecraft for the entire period from launch to landing. This was also the last successful flight of Challenger. 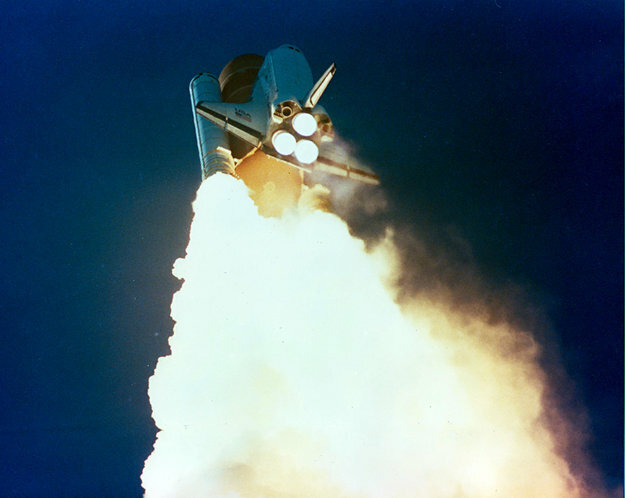 Space Shuttle Challenger flight STS-61A carried Wubbo Ockels, Ernst Messerschmid and Reinhard Furrer, and marked a number of firsts in European human spaceflight, including the first Dutch citizen in space. 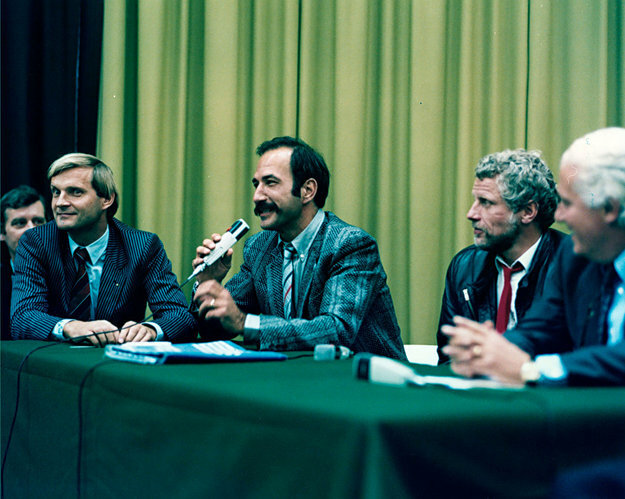 Between 30 October and 6 November 1985, these three European astronauts served as payload specialists (science astronauts) on the first spaceflight with a crew of eight (STS-61A still holds the record for the largest crew aboard any single spacecraft for the entire period from launch to landing). 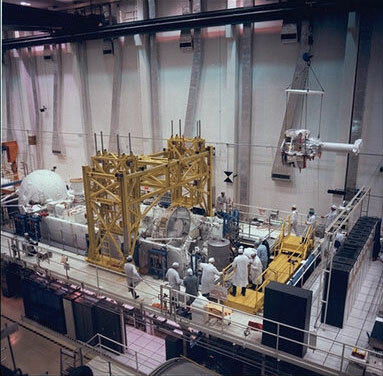 This was only the fourth flight of Spacelab, the ESA-designed laboratory module carried in the Shuttle’s payload bay, but this was the first time that an entire payload was controlled from outside NASA’s mission control centres. Called the Spacelab D1 mission, it was the first to have German mission management and to be controlled from the German Space Operations Centre of the German Institute of Aviation and Spaceflight Research and Development (DFVLR, a precursor of present-day DLR) at Oberpfaffenhofen, near Munich. Wubbo Ockels became the second ESA astronaut and the first Dutch citizen in space (not the first Dutch-born astronaut, he was preceded by naturalised American Lodewijk van den Berg, who flew into space five months earlier). 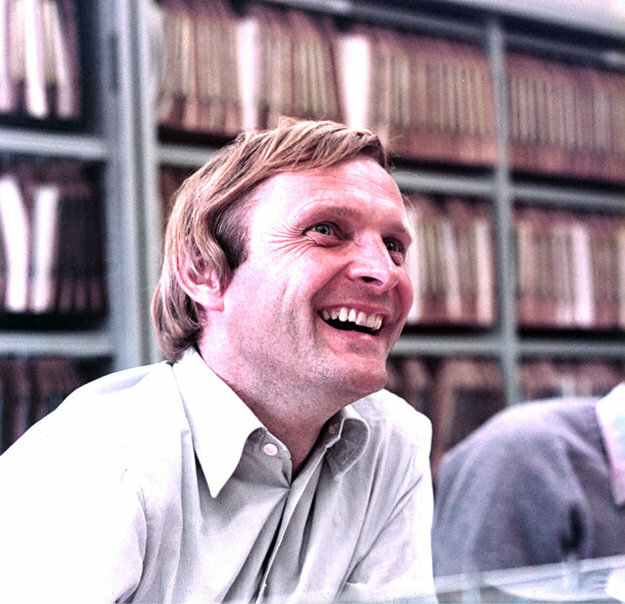 Messerschmid and Furrer became the joint third German astronauts in space (after Sigmund Jaehn and Ulf Merbold). The NASA crew members were Commander Hank Hartsfield and Pilot Steve Nagel, with Mission Specialists Bonnie Dunbar, Jim Buchli and Guy Bluford. 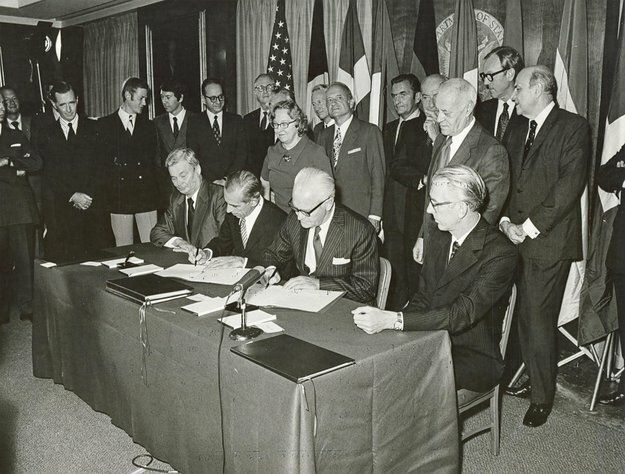 Signature of the Spacelab Memorandum of Understanding between ESRO and NASA at the State Department, Washington DC, USA, on 24 September 1973. The Memorandum was signed by Alexander Hocker for ESRO and James Fletcher (NASA Administrator). Also present are Charles Hanin, chairman of ESC, Professor M. Levy, Chairman of ESRO Council and Roy Gibson. 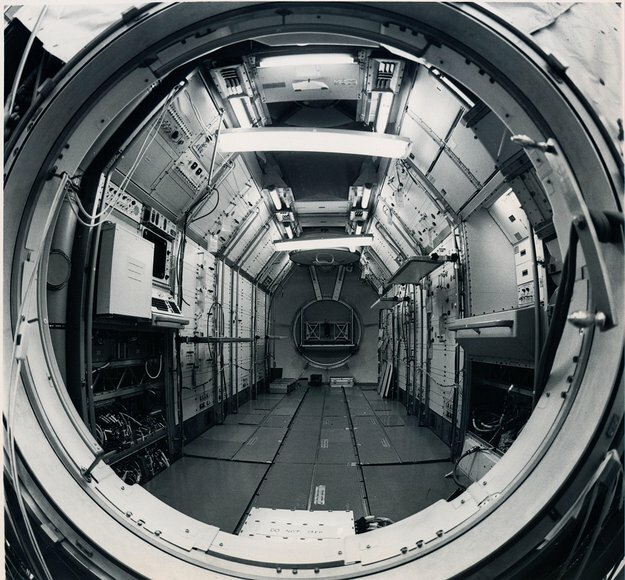 Interior view of the engineering model of ESA's Spacelab-1 during integration at ERNO in Bremen, 1979. 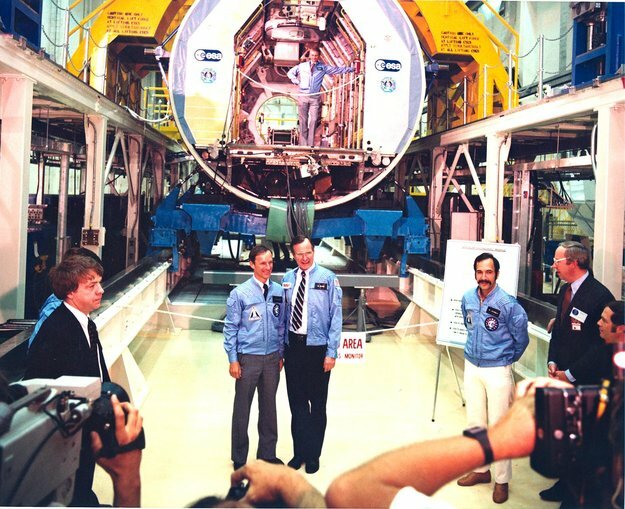 Vice President George Bush (centre) in front of the Spacelab Engineering Model with ESA astronaut Claude Nicollier (left), at Kennedy Space Center, February 1982. At right are Spacelab-1 back-up Payload Specialist Wubbo Ockels of the Netherlands, James McCulla, Public Services Branch, NASA Headquarters, and James C. Harrington, Director of the NASA Spacelab Program. 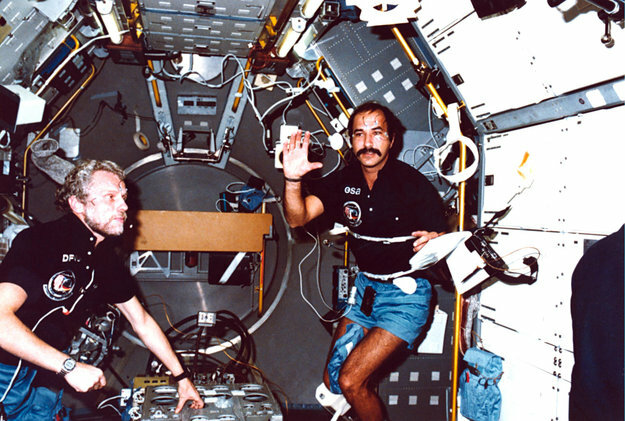 Behind, NASA astronaut Owen Garriott stands in the Spacelab Module. Payload Specialist Ernst Messerschmid, German science astronaut for the European Spacelab D1 mission, during a training session at ESTEC in June 1984. 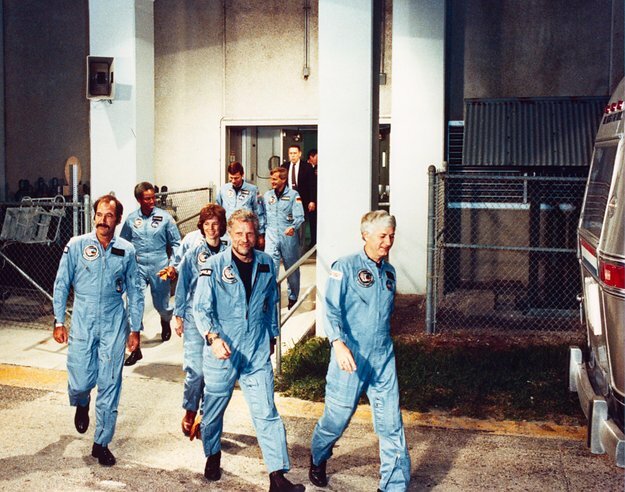 On 30 October 1985, the international crew of the Spacelab D1 mission, led by NASA Commander Hank Hartsfield, leave the crew quarters at Kennedy Space Center to ride to the launch pad. After the Commander, Reinhard Furrer (DE), Wubbo Ockels (NL), Bonnie Dunbar, Guion Bluford, Steve Nagel and Ernst Messerschmid (DE). Launch of Space Shuttle Challenger STS-61A on 30 October 1985, at 18:00 Central European Time, from Kennedy Space Center, Florida, carrying eight international astronauts and the fourth Spacelab, the ESA-developed laboratory module, on the Spacelab D1 mission. 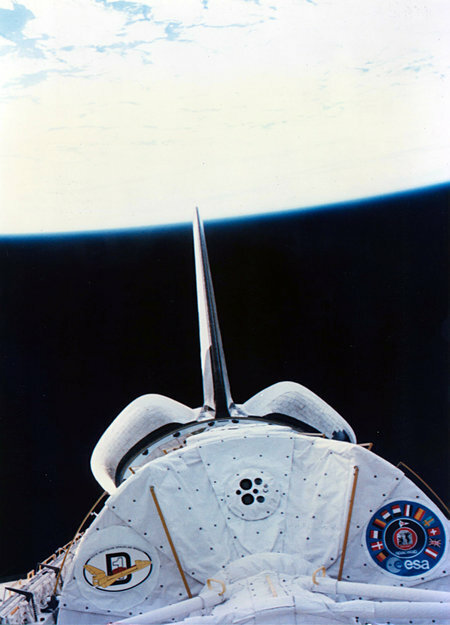 An inspiring view of the Spacelab D-1 module in the Shuttle Challenger's open payload bay, viewed through the flight-deck rear windows. The Shuttle manipulator arm is on the right, and the disc of Earth in the background. The Spacelab D1 mission flew in space between 30 October and 6 November 1985. 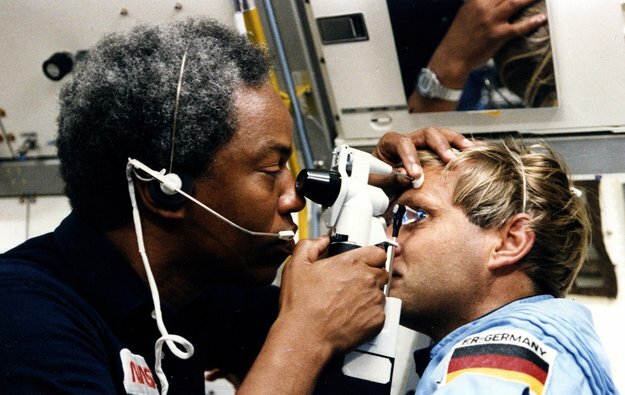 ESA's Wubbo Ockels, Payload Specialist on STS-61A, and NASA Mission Specialist Guion Bluford (right) during the Spacelab D1 mission which was under operational management of the German space research institute, DFVLR. This was the fourth flight of the ESA-developed Spacelab on the Space shuttle. ESA Payload Specialist Wubbo Ockels and his German colleague Reinhard Furrer (left) on the Shuttle Challenger during the German Spacelab D1 mission (30 October to 6 November 1985). Ockels presents the 'Egg of Columbus': the egg floats standing on its small side in 'zero gravity'. The fun-experiment implies a link to the future of manned spaceflight, with the Columbus laboratory being one of the major European contributions to the International Space Station then being designed. 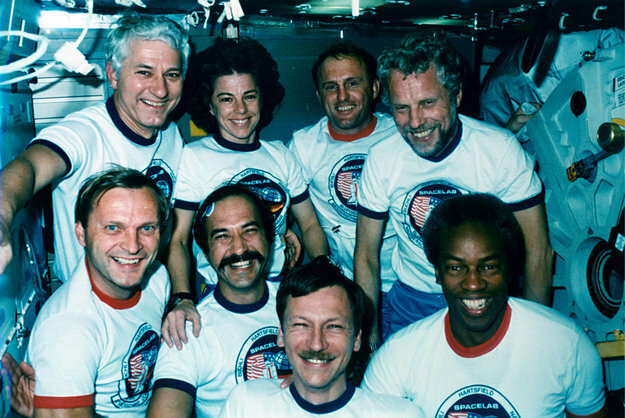 The crew of the Spacelab D1 mission (30 October to 6 November 1985) pose on the mid-deck of the Shuttle Challenger. 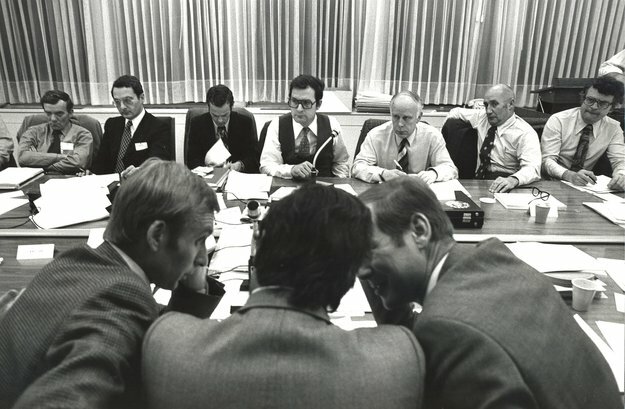 From left, top row, Hank Hartsfield, Bonnie Dunbar, Steve Nagel, Reinhard Furrer (DE), below, Ernst Messerschmid (DE), Wubbo Ockels (NL), Jim Buchli and Guy Bluford. Spacelab D1 science astronauts during their post-flight tour at ESTEC, Noordwijk, on 25 November 1985. 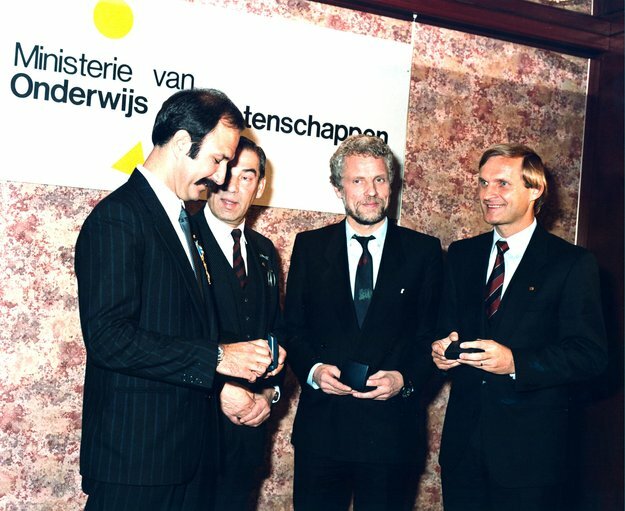 Left, Ernst Messerschmid (DE), Wubbo Ockels (NL) and Reinhard Furrer (DE), with ESTEC Director Prof. M. Trella (right). During the post-flight tour of the European Spacelab D1 astronauts visit the Netherlands. Wubbo Ockels (ESA), Reinhard Furrer (DFVLR) and Ernst Messerschmid (DFVLR) received honourary award from the Dutch Academy of Science and medals of 'Officer van Oranje-Nassau', the latter being presented by the Dutch Minister of Education and Science, Dr W.J. Deetman in the name of HM Queen Beatrix of the Netherlands, 25 November 1985. STS-61A was a scientific Spacelab mission funded and controlled by West Germany, hence the name D1 (for Deutschland 1), in October/November 1985. This patch was worn by the European Payload Spacialists Ernst Messerschmid (DE), Reinhard Furrer (DE) and ESA astronaut Wubbo Ockels (NL). A test subject sitting on Sled, an ESA experiment launched on Spacelab-1 on 28 November 1983. 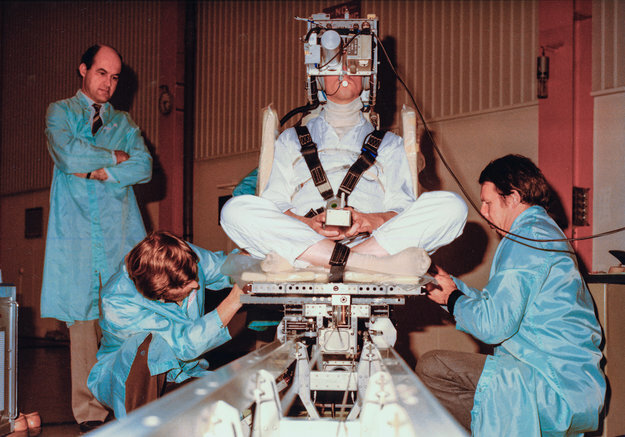 Sled investigated space sickness by monitoring eye movement as the seat moved horizontally and tilted while cold or hot air was blown into the astronaut’s ears. The vestibular system in the inner ear helps to keep balance and navigate the space around us. In weightlessness an astronaut’s vestibular system works differently and the sense of equilibrium changes, causing space sickness. 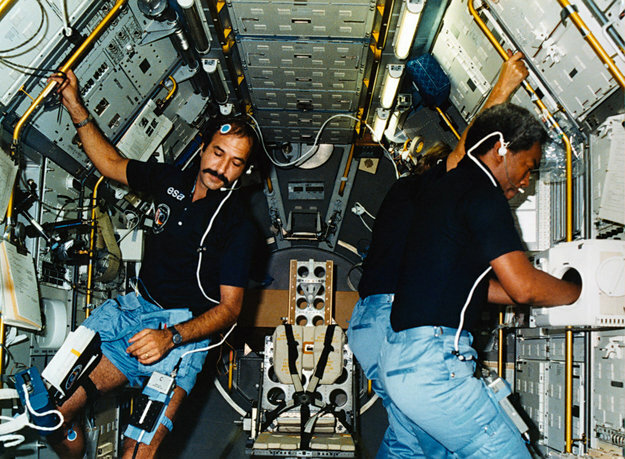 The Sled experiment allowed researchers to understand how the vestibular system adapts to living in space. Spacelab was a European-built reusable space laboratory that flew on the Space Shuttle from 1983 to 1998. Elements of Spacelab design feature in later ESA space hardware such as the Columbus laboratory and the Automated Transfer Vehicles. Spacelab surveyed the possibilities of weightless research in many scientific areas, paving the way for research on the International Space Station. 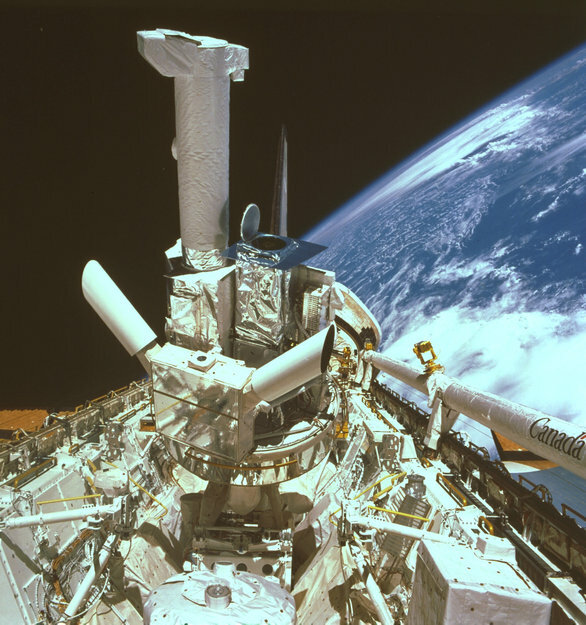 Spacelab experiments led to space-age metals used in mass-produced smartphones and revealed areas of space research that show promise in treating chronic muscle diseases. 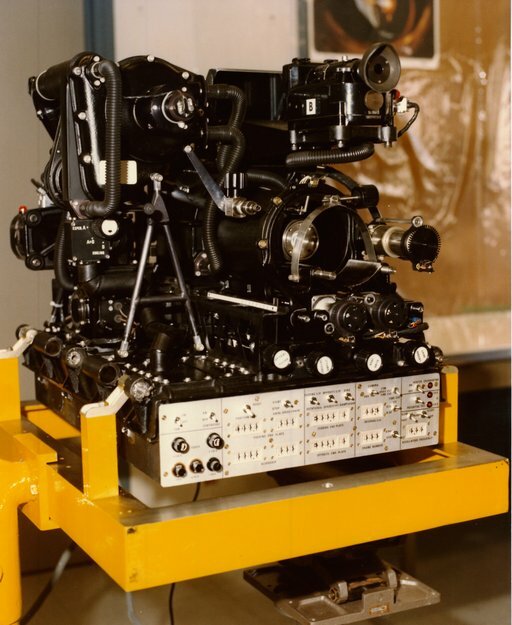 The Italian-built Fluid Physics Module that flew on the first mission of the European Spacelab in 1983, seen here at ESTEC in October 1981. The module allowed astronauts to observe and manipulate up to a litre of fluids in space. 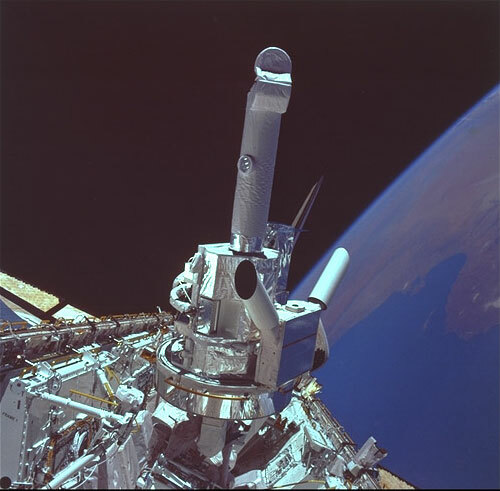 ESA's Instrument Pointing System (IPS) provided high-precision pointing for astronomical telescopes on Spacelab missions. It has flown three times: Spacelab-2/STS-51F in July-August 1985; Astro-1/STS-35 in December 1990; Astro-2/STS-67 in March 1995. 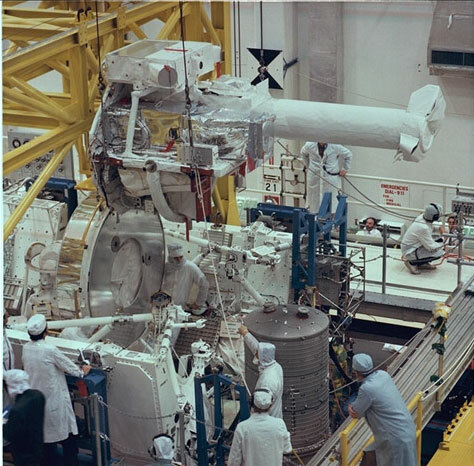 Shown is Spacelab-2, when the drum-like IPS carried a package of four solar telescopes. 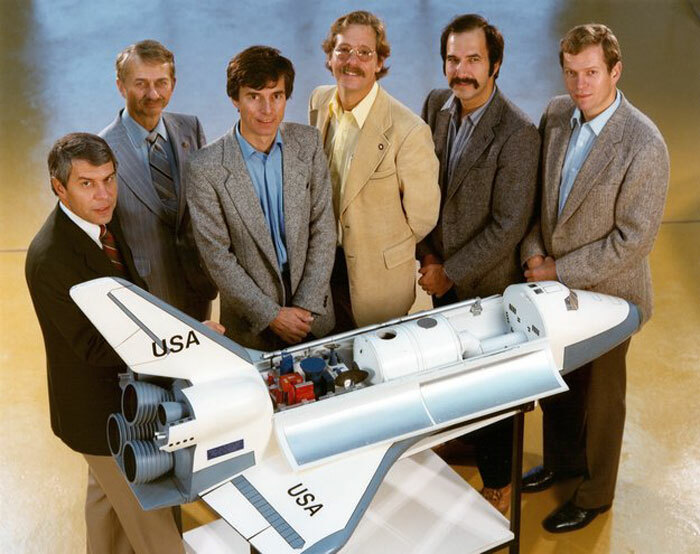 Spacelab-1 mission and payload specialists, with backups: Robert Parker, Dr. Owen Garriott, Germany’s Ulf Merbold, Michael Lampton, The Netherlands’ Wubbo Ockels, and Byron Lichtenberg pose with a Spacelab model berthed in a shuttle. This week marks 30 years since the first Spacelab mission.